Dr. Jihad Abouali completed a Fellowship in Sports Medicine and Arthroscopy at the University of Toronto. Prior to this, he earned both his Medical Degree and completed his residency in Orthopaedic Surgery at McMaster University. Dr. Abouali is a member of the Division of Orthopaedic Surgery at the Michael Garron Hospital, as part of the University of Toronto. He has been invited to present sports medicine research at numerous National and International conferences. He has consulted with many professional sports teams including the Toronto FC and Toronto Argonauts. In 2015 he was appointed as Lead Medical Doctor for the Toronto 2015 Pan Am Games. 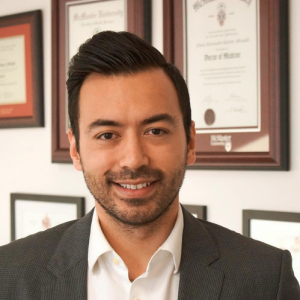 His practice involves treating recreational, amateur and professional athletes with upper and lower extremity injuries, with a special interest in arthroscopic knee and shoulder surgery.